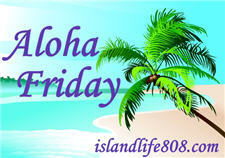 My Aloha Friday question for today is: What is the longest period you went without eating or drinking? Not too long… maybe a day at the most during high school when fasting became the “in” thing to do. I actually have very little will power to fast. I wish you the best. I have fasted for about 24 hours before for a surgery but I do regularly fast on Fridays during Lent although it is not so strict that I can not have water. Not very long, at all! I guess maybe the longest would be while I was in labor/giving birth to my first son – around 12-14 hours. The only time I fast is when I’m sick, have lab test or when I have a sore throat. So, the longest was probably 24 hours. Every year I fast to atone my sins…whatever they may be. Harriet recently posted..She’s older than I am- doesn’t have a wrinkle- can still dress like that- and has a great looking car! 48 hours. In high school, I was best friends with a gal who was Lutheran. Her church had a weekend “retreat” where participants went 48 hours without food to see what it was like for many in poorer countries. When we were allowed to eat, it was the local fare of one country in particular (I don’t recall which country, all I recall is rice with raisins). Sobering affair.